Dave is coming back to Columbus for a visit and we will be at Skully's on the 18th. Come join us for fun and frivolity. 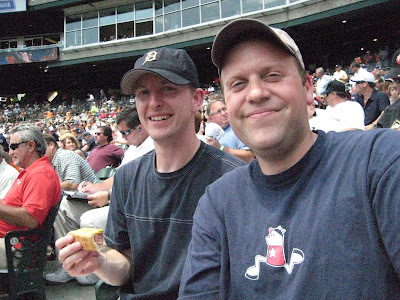 This is Dave and I in July of 2008. We snuck off to Detroit to go check out an exhibit and accidentally made it to a Detroit baseball game. We had a lot of fun that day. If I realized how much I would miss him I assume that we would have snuck off more often. Now it costs a few hundred bucks just to spend a day together, but seeing how it is him paying for it, it is totally worth it. Come out and meet up with us if you get a chance. E-mail me for info: holyjuan@gmail.com.